For the community, see Guysborough, Nova Scotia (community). For the district municipality, see Municipality of the District of Guysborough. 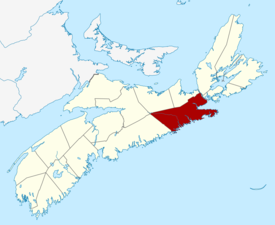 Guysborough County is a county in the Canadian province of Nova Scotia. Taking its name from the Township of Guysborough, which was named in honour of Sir Guy Carleton, Guysborough County was created when Sydney County (Antigonish County) was divided in 1836. In 1840, Guysborough County was subdivided into two districts for court sessisonal purposes – Guysborough and St. Mary's. In 1863, the boundary between Halifax County and Guysborough County was altered and a polling district was added to Guysborough County. In 1879, the two districts were incorporated as district municipalities. As a census division in the 2016 Census of Population conducted by Statistics Canada, Guysborough County recorded a population of 7,625 living in 3,549 of its 5,190 total private dwellings, a change of −6.4% from its 2011 population of 8,143. With a land area of 4,044.15 km2 (1,561.46 sq mi), it had a population density of 1.8851.9/km2 (4.8834.9/sq mi) in 2016. Black Lake listings within Nova Scotia. ^ "Population and dwelling counts, for Canada, provinces and territories, and census divisions, 2016 and 2011 censuses – 100% data (Nova Scotia)". Statistics Canada. February 8, 2017. Retrieved February 12, 2017. Wikimedia Commons has media related to Guysborough County, Nova Scotia. This page was last edited on 24 December 2018, at 03:04 (UTC).